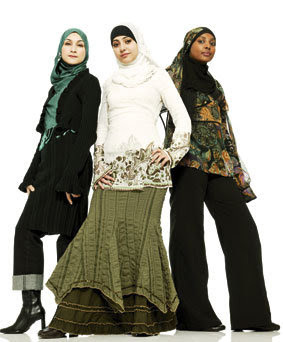 Check out this gorgeous picture which was featured in a Danish youth magazine, in an article about hijab and fashion in April '07. The girls are like hijabi Charlie's Angels! It is nice to put some style into our Islamic dress code. However, hijab is more than just covering the hair. These ladies are not covering their bosom as commanded in the Qur'an by Allah. From what I can see of the girl in the middle, the clothing is tight. I see many sisters who dress in this fashion as shown in the picture, and while their iman may be very strong, I feel that clothing that is not modest is a weakness that us sisters need to overcome, inshaAllah. Anonymous: I was a new muslim revert once, and trying to find Islamic clothing with no money to work from is hard---sometimes we modify our clothes just to COVER all our skin. I am a jilbab/abaya 24 seven girl and I am not one to okay tight clothing, but you try to find ong sleeves in the summer and see how modest you can come up with in just one trip to the mall. It is difficult, but these girls are trying: I bet when they marry they become full-time Jilbab devotees, or at least swear by manteaus.... It is hard to online abaya shop when you're not old enough to get a credit card. 4) made me look unnprofessional during interviews and other positions that professional attire was required. An Abaya/jilbab isn't the ultimate solution to wearing proper hijab. You can dress in regular clothing and modify it to fit the Islamic criterion for modesty. OMG, I looooove the middle girl's outfit! For in the house/ around my friends, mind you, not in public - I wear 'aabayah outside. The skirt and top are GORGEOUS!!!!! Hmmmm... it's odd, 'cuz I've got lots of friends who wear abaayas/ jilbaabs and big khimaars, but manage to look slimmer (and I'm talking bigger-sized women here! ), younger, pretty AND professional! And as a teen, I like to make sure I look nice even if I'm wearing abaayah and a big hijaab - I'll use pretty brooches and funky pins, wear colourful headbands under my hijaab (stops it from slipping), wear a really neat sweater... stuff that keeps it hijaabish, but also cool! Organic thank you for that, I really didn't have the energy to repeat myself on the issue. I wish people would appreciate what these girls are trying to do.. this article was in a teenage magazine, and I'm sure you know what those are full of. So for three young ladies to come and say 'hey, we care about our faith, we are modest, but not out of touch' take a lot of guts. Kudos to them. I think these girls did a pretty good job. They are fully covered while maintaining a sense of style. Its not easy being a young hijabi when their friends are in tube tops and shorts complaining. I think they are doing great for their age in a country like Denmark. There are many older women who struggle with wearing hijab in Muslim countries. This is awesome! what is the name of the magazine? and is there any way I can read the article online? I found this photo without the link to the article unfortunately! Anonymouse: I've been wearing jilbab with huge khimar since I was a teen (Approximately for 8 years now). I still own many jilbabs and khimars and do wear them occasionally (while teaching Sunday school, attending the mosque, etc). I've found many stylish jilbabs and I love wearing them, especially the two piece jilbabs that are layered (see Islamic boutique's catalog, I sorta own everything they sell). My first year volunteering in the public schools I used to go in with my regular jilbab and long khimar. I would wear nicer colors so the kids wouldn't fear me so much. When I wear an abaya/jilbab, I usually wear clothes underneath (shirt+ skirt or pants). Then I would wear my jilbab and if it's cold outside a coat. When I walk around in a classroom, I found that I wasn't flexible to bend, kneel and do all those things you require to do in the presence of little children (including running and jumping). Wearing a two piece outfit gives me much more flexibility a jilbab didn't provide. Also my long khimar was always in the way of my work (doing crafts,etc). A smaller wrap shayla definitely is easier, especially if you tuck it under your shirt/tunic. These days I wear flared pants with really long tunics (mostly dresses). My outfits end up looking like a Shalware Kameese. I used to think that a jilbab was the ultimate way for modesty, but I was wrong. You can dress modesty in any style. A person must learn about their body type and dress accordingly. Anonymouse: LOL you know what I wear around the house with my friends: if it isn't a pretty jalibyia (which with you hair looks SOOOOOO stunning, Masha'Allah) it is NOT full hijab. I like to wear long jersey halter dresses (cuz I am so glam, LOL---not really) and cute shrug sweaters (and all the jewelry I can stand), else soft khaki trousers and tees from Club Monaco. But you are my Khaleeji girl along wih Aalia (even though your South African like me! LOL). Hayah: anonymouse and me like jilbabs and I think they CAN be soooo modern and stylish but I agree all, one can dress modestly without a robe, but a robe IS certainly easiest (no fussing), and I am lazy LOL. hi my fellow sisters i need a new way to wear my hijab the old way isnt working got any tips? I think they all look beautiful and i dont think that the girl in the middle is wearing tight clothes she is perfectly fine and i just started a hijab in the past month and so i dont think i wear bad clothes i wear long sleeves and i look ok and i dont think that the girl to the right has a short shirt. The second comment was not nice i think they are all beautiful and allah is happy with the way they are and they dont have to wear a niqab, niqabs are just a joke i dont noe why ppl wear them hijab and following the rules of the hijab is easier! !